Prior to the amalgamation of CRT (South Island) and Farmlands (North Island), each trader had its own method for providing their customer's monthly statements which in turn produced its own file format (layout) for each statement. CRT customers were able to download statements from the CRT website, while Farmlands customers received an email and the import options in Cashmanager reflected this. Now all shareholders can access the Farmlands website, signup for the automated data feed, or receive their monthly statement via email which means that you need to select the import option based on how you retrieve the monthly statement, not based on your location. 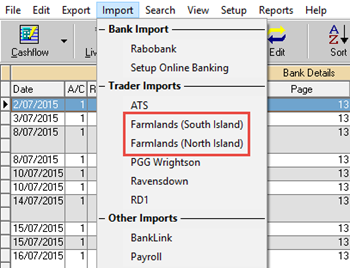 Any future updates to Cashmanager RURAL will clearly outline which Farmlands import option you should use. But in the meantime, which option should you select? Use this option if you log into the Farmlands website and retrieve the monthly statement or if you use the automated Farmlands Feeds. Select this option if you receive your monthly statement via email.